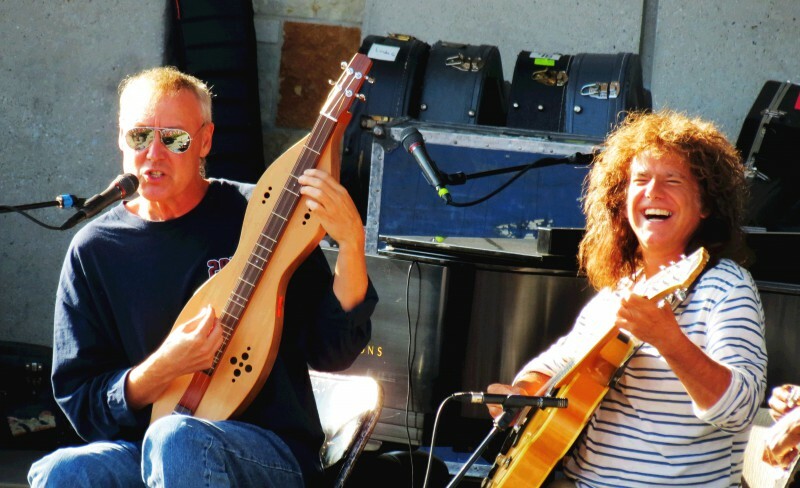 With a heady mix of songwriting, techinical skills, jazz improvisation and a 42-stringed guitar, Pat Metheny Unity Group and Bruce Hornsby deliver an ethereal performance at Frederick Meijer Gardens. The crowd has fallen silent, captivated by the smooth jazz lullabye. The birds and insects of Meijer Gardens can be heard calling out to each other as if they know the tune flowing from the guitar of Pat Metheny. Not a single member of the audience dares to speak, or cares to speak, as they all simultaneously know they are witnessing something special. Moments like this are what make concerts at Meijer Gardens so unique. Throughout the Pat Metheny Unity Group with Bruce Hornsby concert at Meijer Gardens, these special musical moments came as often as the steady breeze through the flowers that line the front of the stage. 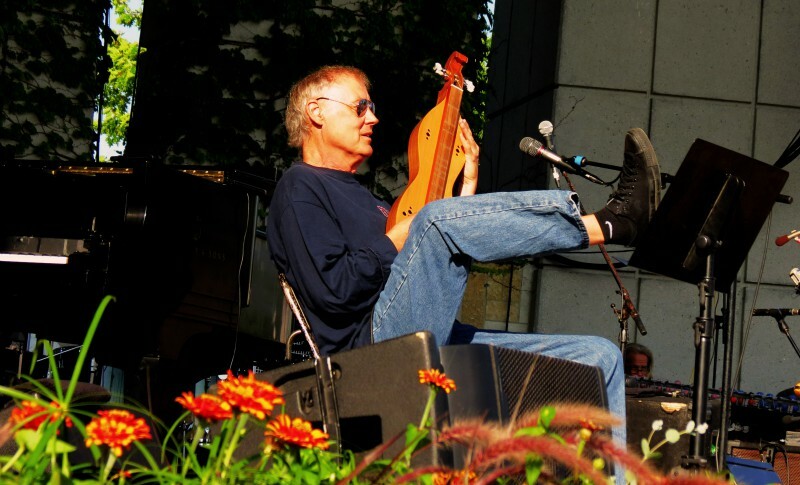 Hornsby starts off the evening’s music by coming to the front of the stage, sunglasses donned, and picking up a rarely seen instrument in contemporary music– an Appalachian dulcimer. Thin like a fiddle and long like an acoustic guitar, this Appalachian dulcimer has four strings, and is played like an upright bass, but with a pick. As he plays the dulcimer, Hornsby leans back in his chair, foot up on a music stand, and flashes a huge smile. Shortly thereafter, he is joined by Metheny for a song. The passion for playing and connection between these two artists was immediately apparent, as the two spend much of the song smiling and laughing at each other’s subtle improvisations. Metheny leaves the stage, and Hornsby begins a set with just him and a drummer, Sonny Emory. “This is a song about depression and drugs- I hope you like it,” Hornsby says in his playful, ironic tone. Contrasting upbeat piano with lyrics about taking everything from Adderall to Zoloft, Hornsby sings “Life in the Psychotropics,” getting multiple laughs from the crowd along the way. As Hornsby plays, it is clear his passion for music continues to thrive through improvisation. Each song he played featured improvisation not only between him and Emory, but the lyrics often were humorously improvised by Hornsby to “make sure [the audience] is listening.” During one improv section, he echoed multiple hollers from the crowd as his fingers majestically danced around his piano keys. Hornsby’s infectious charm never relented throughout his performance, which closed on a standout rendition of “King of the Hill” from his 1998 album Spirit Trail. Not to be outdone, Metheny comes on stage immediately following Hornsby, picking up a truly unique instrument – the 42-string Pikasso guitar. Designed specifically for him by Manzer Guitars in 1984, this guitar features two necks, and crisscrossing strings covering nearly the entirety of its large body. 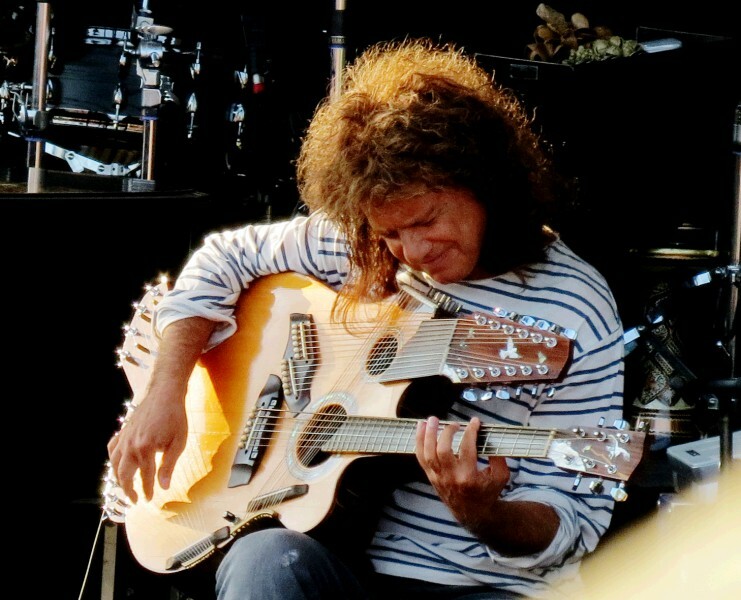 With no accompaniment, Metheny begins playing “Come and See” on the Pikasso, an instrument that combines the sounds of a guitar, harp, and the Japanese koto to create a rich, full sound unmatched by any single instrument in the world. If that isn’t enough, Metheny also utilizes the custom-made Orchestrion, an array of mechanical marimbas, glass bottles, and percussive instruments that play in unison with Metheny as he performs on his guitar. This is a large part of his set, and, aside from his Pikasso, one of the more impressive things that can be seen in a live setting. While the night of music was nothing short of spectacular, I couldn’t help but notice something strange happening – or not happening, rather – among the crowd. This doesn’t speak to the quality of music, or even the crowd’s enjoyment, but nobody seemed to be dancing. Maybe it was the fact that there is a certain set of etiquette for jazz shows, maybe it’s because the average crowd member was over 40 years old, maybe it was the intimate setting of Meijer Gardens and quiet nature of some of the songs, but music that relies so much on improvisation an spontaneity demands more than just polite clapping and toe-tapping. It is a disservice to such free flowing music to not let the music then flow through your limbs and into the ether created by the musicians. On the other hand, people should be allowed to enjoy the music in whatever way they see fit. Those who stayed through the three-plus hour long show definitely enjoyed themselves, and the music never failed to impress, which is what a Meijer Gardens experience is all about.